The EQUATOR mission is to achieve accurate, complete, and transparent reporting of all health research studies to support research reproducibility and usefulness. In addition to our main EQUATOR website we have begun compiling specialist collections of resources about reporting for individual specialties which we hope will provide practical help to clinicians and researchers in the implementation of reporting guidelines within their research. This oncology specialist collection is the first such collection and it is at an early stage of development. 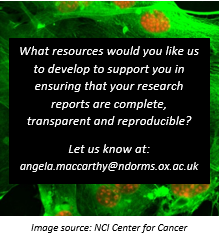 In the meantime, whilst we develop a comprehensive resource, we hope that the information and resources highlighted here are helpful to oncology researchers. 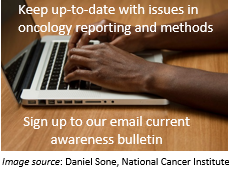 The UK EQUATOR Centre has recently published an article in the British Journal of Cancer entitled ‘Reporting guidelines for oncology research: helping to maximise the impact of your research‘. An editorial published in the same journal praised this first step by EQUATOR Oncology. Visit our archive of previously highlighted new publications and resources of interest. The development of this cancer-specific project within the EQUATOR Network is funded by Cancer Research UK (CRUK).